When you think about it, it’s kind of a miracle I willingly saw this show. I am very easily upset by any media in which bad things happen to animals- I call offending shows, movies, books, etc either “not rated E” or “not Erin-friendly”. 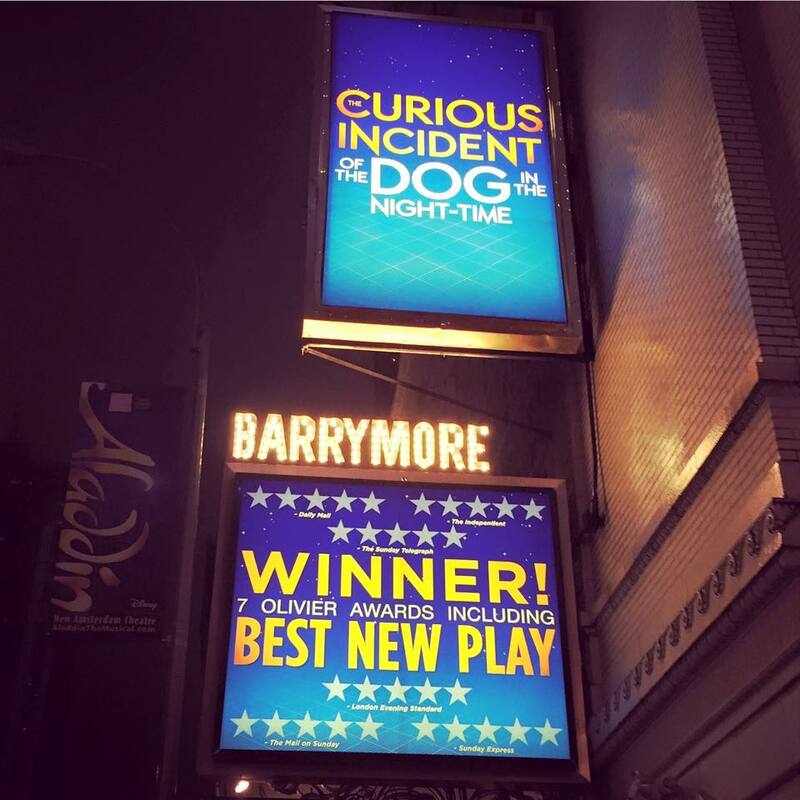 When I was planning this trip, The Curious Incident of the Dog in the Night-Time was not really on my radar, but upon reaching out to theater friends to get their recommendations for which shows I should see on my trip, it came up frequently and enthusiastically. I could not ignore so many rave reviews, so I chose to overlook the fact that the inciting incident of the story is a dog being murdered by a garden fork and take myself down to the Barrymore Theater on the last night of my trip. The Curious Incident of the Dog in the Night-Time is based on a 2003 book of the same name by Mark Haddon, which I read on the plane to New York because I always like to read the book first. I finished it in one sitting, enjoyed it thoroughly, and began to fear it may have been a mistake to read it so close to seeing the show because it would make every little difference and change stick out like a sore thumb. This fear turned out to be completely unwarranted because the stage version is among the most faithful adaptations of a piece of literature I’ve ever seen. Many scenes are word-for-word straight out of the book. The book, which is told in the first person, follows the story of Christopher, a 15-year-old British boy with high-functioning autism, who discovers a dead dog in his neighbor’s yard and goes on a mission to solve the mystery and figure out what happened. Along the way he learns some difficult truths about his own life and family. The stage adaptation debuted in London in 2012 and won seven Olivier Awards before transferring to Broadway in 2014. The main difference between the book and the play is that the stage version chooses to present the story as a play within a play rather than from Christopher’s point-of-view. The character of Christopher’s teacher narrates and frames the show by reading aloud Christopher’s account of events. By far the most striking thing about this production is the staging, the direction, and the incredible physicality of the talented ensemble of actors. The stage is essentially a blank slate that transforms into every locale necessary through use of innovative staging, projections, and movement. For example, in one scene Christopher enters his house and performs several basic actions- setting keys down on a table, hanging up a jacket, etc. The ensemble of actors moves quickly to become the table, the coat rack, and virtually everything else needed. Christopher spends most of act one building an elaborate model train around the entire stage, taking pieces out of compartments in the walls a little bit at a time until his masterpiece is complete. The best comparison I can make is to the play Peter and the Starcatcher, which also used the actors and their movement in a very unique way to really elevate what would otherwise be very simple staging. This comparison makes a lot of sense, considering Steven Hoggett, who co-choreographed this production with Scott Graham, is also responsible for Peter and the Starcatcher, American Idiot, and Once. The show also makes excellent use of projections, usually of words and mathematical equations to show what it might be like inside Christopher’s brain. Probably the single most stunning staging moment comes in act 2, when Christopher appears to literally scale a wall, which then transforms into an escalator that he rides down. The ensemble of actors is led by the phenomenal Alexander Sharp as Christopher. The role is so physically and emotionally demanding that an alternate, Taylor Trensch, regularly performs the role twice a week. Sharp pours every ounce of energy he has into this incredibly complex character and is simply fantastic, and I predict he will take home the Tony for Best Actor in a Play come June. He had the audience in the palm of his hand from the first scene until well after the curtain call, when he re-takes the stage to show audience members who decide to linger (nearly everyone at the performance I attended did) how his character solved a complicated math equation that plays an important role in the story. I will admit- I tend to gravitate more towards musicals than plays. But every now and then I see a play that has a lasting effect on me. Next Fall, The Circle Mirror Transformation, and Other Desert Cities are recent examples that come to mind. This play definitely fell into that category. I am writing this review a full month after seeing it, and yet it has been the easiest to write of any of the reviews from my trip to New York. It is simply a stunning work of theater that tells a poignant, funny, and moving story in a very imaginative way. Also, minor spoiler alert, it makes up for being generally Erin unfriendly with an absolutely adorable live puppy at the end. I cannot encourage you enough to see it if you have the opportunity. For more information and tickets, please visit www.curiousonbroadway.com. Pro tip: $27 tickets are available in the last rows of the mezzanine for every performance.